Wenhau Safaris & Tours is owner operated. The company was founded in 1999 and the very first office was opened in Victoria Falls. Since then the company has spread the wings with another office opened in Harare Zimbabwe and to date we have established full operations in Livingstone Zambia, Kasane Botswana. The founders are registered and qualified guides one with both qualifications as a Safari, Nature and Cultural guide with a very sound aviation background. He is involved with the day to day running and guiding work and he sits on several boards and associations in the tourism & aviation sectors. Our team comprises of personnel who have been with the company since its inception with a combined experience of over 30 years. 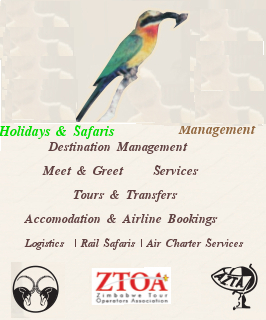 We believe in customer satisfaction as a critical element to our success which has seen us being awarded some prestigious awards in the tourism and aviation ground handling services.We are representatives and agents for some of the most reputable tour operators in the region and beyond.